After news that government officials would be testing the efficiency of iOS 7’s Activation Lock against thieves, San Francisco District Attorney George Gascón has come out in support of the feature, saying that “clear improvements” have been made to stop criminals, according to the San Francisco Examiner. Last week, Gascón and New York Attorney General Eric Schneiderman brought in security experts from the Northern California Regional Intelligence Center to test out Apple’s Activation Lock feature as well as Absolute Software’s Lojack service on the Samsung Galaxy S4 in order to determine how effective they are against thieves. "I'm very optimistic that they came and were willing to share their technology with us," Gascón said in a statement, also noting that Microsoft and Google had not yet come forth with their plans to combat theft. Gascón did not detail how the specific features work, explaining that they were not yet finished. Both attorneys called for the tests as a part of the Secure Our Smartphone (S.O.S) program that aims to stop the theft and black market resale of stolen mobile devices. While carriers have already established a database to track stolen phones, it has proven to be largely futile. Prior to these tests, Gascón and Schneiderman called for smartphones to have a kill switch that would disable them in the event of theft. 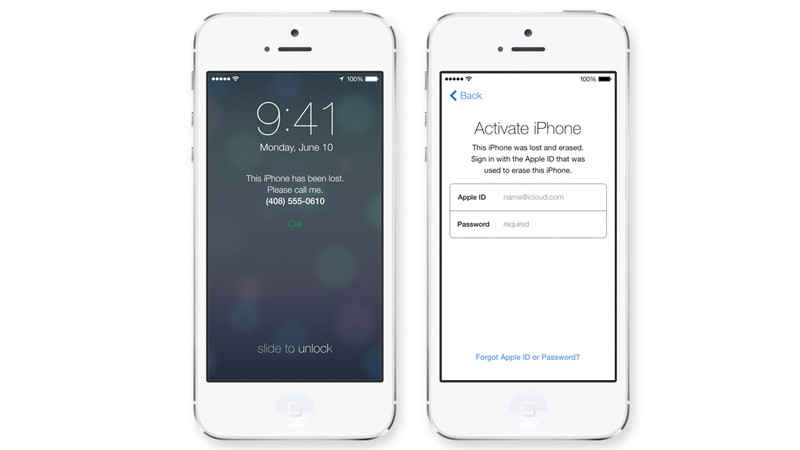 Announced at WWDC, Activation Lock is set to be included in iOS 7, which is expected to be released to consumers this fall. Yea as if Mr gubmint here isn't gettin a free iPhone 5S after making such positive comments. Seriously? Your accusation is based on what proof exactly? What's wrong with you? You cannot prosecute thousands of stolen phones. Go outside and learn something about the real life.. I don't see how phone theft/loss is any kind of issue that warrants District Attorneys, governments, and phone manufacturers to somehow deter it. 2)Smartphones are all software...regardless of how one "secures it", a true thief will know this and either he/she or the "black market" will easily unlock it. Period. 3)Laptops have been lost/stolen for decades and you don't see Apple/Wintel working to prevent that. What about iPods, cd-walkmans, watches, handbags, etc? Again, don't lose your stuff and/or leave it around where it has a fair chance of being stolen. 4)If your phone gets lost or stolen, big deal...you call your Carrier, they assure you won't be billed to data/calls it makes, you plunk down $$$ for another phone, and you move on. Sure, you may have lost your pictures or possibly opened up your email to a thief...but a)go change your password(s) on your email system super ASAP and b)life's tough...so you lost some pictures. 5)How about this scenario: You buy a used phone on eBay or from a friend and days later the seller reports the phone stolen just to be a jerk. This topic has been talked about for over a year and it always is made to sound like a band of criminals is following you down the street waiting to knock you unconscious and steal your phone. Not in the USA...and not in most civilized countries. So many errors of thought in the above it deserves a rebuttal, but I don't have the time. Wow, really? "gubmint"? Free iPhone? Some people just think everything is a conspiracy. I'm not a fan of big government, but this looks more like the way things should work. That is, DAs note that there is a rash of a particular kind of crime and put out a call to request that businesses making those products come up with their own ideas to address the problem. Much better than the traditional government approach of mandating a particular solution that a) stifles innovative concepts that someone else might come with, and b) probably doesn't work. 6)I understand that smartphones are relatively small so they fit in pockets...and could be misplaced or pick-pocketed or even just fall out due to their size...but so are wallets, jewelry, and cash. Again, don't lose the phone just like you try hard not to lose your wallet, jewelry, and cash. I could refute pretty much your whole statement. But im too busy. Not true. Their strategy is to design products no one wants. I was in the subway the other day, someone put a gun to my head and told me, "Take this Windows phone and you won't be hurt." 300 Phones a day snatched from people while using the phone! Thats only in the UK alone! Please get your facts straight before shouting off about how useless this is! If it stops a few people from getting stabbed, shot or killed, then this is certainly a worth while addition!